Italian sausage, San Marzano tomato, onion, carrots, collard greens & cannellini beans. Sliced Beefsteak tomatoes, fresh mozzarella ball, salt and pepper, E.V.O.O. basil chiffonade and balsamic glaze drizzle over greens. Blackened Mahi Mahi chopped on 2 crispy fried corn tortillas topped w/ house chimichurri, roasted corn salsa, shredded lettuce, Chipotle Crema & cheddar cheese!!! Sous Vide cooked, then grilled pork chop w/ our Guava BBQ served w/ sides of butter fried corn on the cob & fruitwood smoked bacon baked beans! Fresh buttered lobster claw and knuckle meat, lightly sautéed in our drunken cream sauce over Lobster Ravioli w/ side toast points. A large portion of Applewood bacon wrapped homemade Buffalo meatloaf over Texas toast topped w/ smashed new red potatoes & mushroom gravy. IT’S A MONSTER! Slightly spicy jerk seasoned Swordfish fillet over sticky jasmine coconut rice then topped w/ Islamorada Pico-de-Gallo (pineapple mango, papaya, & roasted corn). 8oz. Togarashi Seared then sliced Ahi tuna (served rare) over chilled lo mein noodles lightly tossed in a soy/sesame sauce w/ pickled carrot/cucumbers, radish, avocado, red cabbage, crunchy seaweed, fried shallots, pickled ginger & jalapeno. Topped w/ a miso sriracha mayo & a side of sweet chili teriyaki! This entree is served COLD! There are no events scheduled at this moment. Please check back soon. 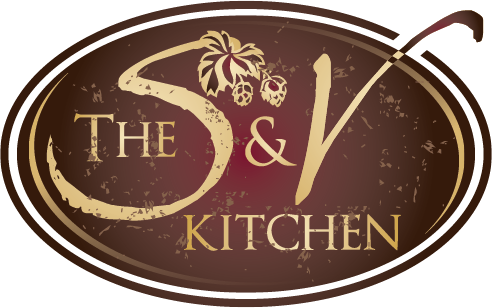 The S & V Kitchen @ Coppertail (the sister location of The Stein & Vine), opened in July 2017, in partnership with Coppertail Brewing located just outside of Ybor City in Tampa. The food menu offers creative, craft food inspired by Chef/Owner Ty Mathis and pairs amazingly well with Brew Master Casey Hughes & superb craft beer. Located inside the Coppertail Brewing Co. tasting room.